When will the phrase “hit into the shift” become outdated? As a baseball fan, you hear it all the time on any MLB broadcast. As I was recently watching the Nationals play the Mets on ESPN, Curtis Granderson hit a groundball right into the heart of a “Full Ted Williams shift”, where Daniel Murphy, the second baseman playing in shallow right field, scooped it up and threw to first to record the out. Image of a Full Ted Williams shift on the Orioles’ Chris Davis, obtained on YouTube, courtesy of Major League Baseball and MASN. 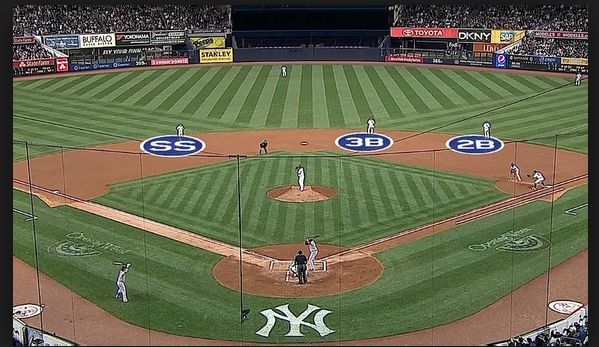 The baseball community generally accepts when the broadcaster says the line of “he hits a groundball into the shift”, but, in reality, what was once viewed as an out-of-the-ordinary defensive alignment reserved exclusively for the big, left-handed power bats, is becoming the standard way to play defense. Think about it: in the NFL, the defense calls plays to prevent the offense from being successful. Teams use different formations to prevent the offense from advancing the ball. In contrast, baseball has historically deployed the same seven fielders in their seven “natural” positions. But why shouldn’t baseball feature similar advancements in defensive strategy as football? 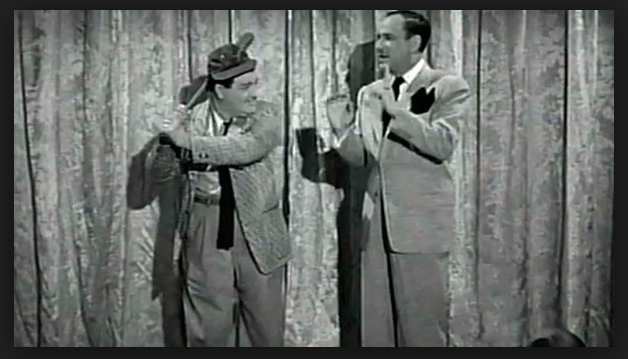 If it makes sense to move players to positions that prevent the other team from getting base hits, then baseball shouldn’t be stuck aligning players the way it did in the days of Abbott and Costello. Baseball is changing rapidly before our eyes, and before you know it, phrases like “grounding into the shift” will no longer carry meaning. The “shift” isn’t anything new; it has been around for a long time, as demonstrated in the next image of a Barry Bonds at bat in a game against the Florida Marlins on August 23rd, 1998. 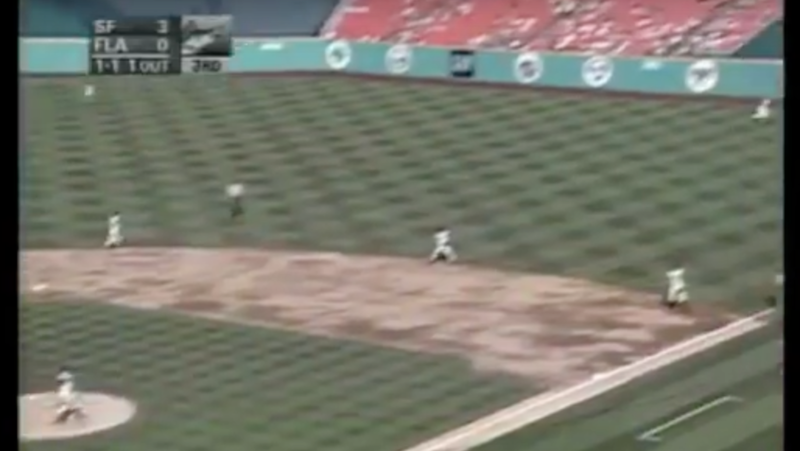 Image of a Full Ted Williams shift on Barry Bonds, obtained from YouTube, courtesy of the Florida Marlins and San Francisco Giants. As you can see in the image above, the Marlins utilized what we now call a Full Ted Williams shift almost 20 years ago in an attempt to prevent Barry Bonds from getting a base hit through the right side of the infield. (Spoiler: He didn’t hit a groundball; he smashed his 400th career home run on a 1-1 pitch, making him the first member of the 400-HR, 400-SB club.) However, while the actual alignment isn’t anything new, the rate at which teams are shifting on players is skyrocketing, thanks in part to the great work Baseball Info Solutions (BIS) is doing. And this year, teams are on pace to shift over 28,000 times. Shifting is quickly becoming the rule rather than the exception. With the increase in shift pace in 2016, teams are now shifting on nearly a quarter of all groundballs. When you consider the factors, the reason why teams employ a shift is simple. If a hitter pulls the majority of his groundballs and short liners, then it makes sense to play players in accordance to the data. This works for both left-handed batters, which we have seen more commonly, but also right-handed hitters as the next image is going to show. Image of a Full Ted Williams Shift on Kris Bryant, obtained on YouTube in a game between the Milwaukee Brewers and Chicago Cubs. The Full Ted Williams Shift is the name for the shift when there are three players playing on one side of the infield, and for left-handed batters, you will often see the second baseman playing shallow right field. The same criteria is met for right-handed batters with the exception being the players are on the left side of the infield. These “Full Ted” Shifts are depicted in the images above. 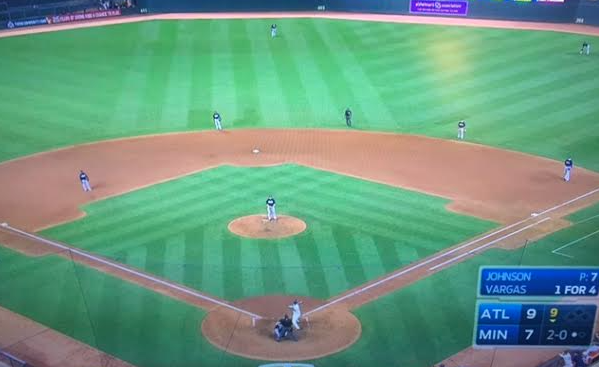 There are also times in which the defense adjusts where the players are positioned, but not over far enough to be considered as a Full Ted Williams Shift. We consider them to be Partial Shifts. Image of a Partial Ted Williams Shift. Obtained via MLBtv. The shift shown in the image above is on a left-handed hitter, specifically Kenny Vargas of the Minnesota Twins. Although he is left-handed, the partial shift is not limited to left-handed hitters. It is also being used increasingly for right-handed batters. In 2015, there were only two teams that shifted at least 1,000 times on balls in play. This year, we are on pace to see as many as nine teams utilizing the shift on balls in play at least 1,000 times. The top 10 teams that have shifted the most so far this year are: Astros, Rays, Brewers, Mariners, Pirates, Rockies, Angels, Yankees, Braves and Reds. Interestingly, the Brewers and the Mariners both saw changes at the top of their organizations. The Brewers hired David Stearns and the Mariners hired Jerry Dipoto to run their teams. Last season, the Brewers shifted 382 times on balls in play, and the Mariners 352. This season, they are both expected to shift over 1,000 times. Clearly, the new regimes decided it was best to follow the revolution that is going on in the game of baseball by shifting more. Teams are shifting more and more, and the data supports this claim. So what are the obstacles that are standing in the way of the the phrase “hit it into the shift” becoming non-existent? It could come down to the managers and coaches becoming more reliant on the data that the teams are providing. But that doesn’t mean they like it. In an article posted to ESPN.com on April 26th by Andrew Marchand, there were some interesting quotes by Yankees Manager Joe Girardi. Strong comments by the Yankees manager whose team, according to the data, have shifted the 8th most times in Major League Baseball. “As long as it is legal, I’m going to play it,” said Girardi, whose team routinely aligns untraditionally. Even a gentleman who is fundamentally against the idea of the shift realizes the importance of the shift in the game. The data indicates the success of the changing of defensive alignment, and teams are using it more and more. There was once a time where the perception was that teams only shifted on the power-hitting left-handed hitters. That perception is now a false reality. What is true is that teams are shifting consistently more and more, regardless of the side in which the batter is standing. There is no longer a normal defensive alignment in baseball, and so the concept of traditional positions for infielders will soon fade. From the integration of all players to the implementation of the designated hitter, America’s pastime has always found a way to evolve into a better version of itself. The same will happen with shifting, and, pretty soon, the remarkable event will not be the use of a shift but rather the non-use of one. The data is becoming stronger and stronger every season. There is an increased amount of important information that teams are gaining more access to, and it is impacting the way the game is being played. As the games are played, and the seasons go by, when will we finally feel the the phrase “hit into the shift” or “the shift is on” become outdated? Before you know it, the shifting experienced by some players will become the norm. ← How has Mike Trout’s Glove Declined?